When we climbed the hill to her house, we found Leh’s most famous Oracle washing clothes by an outside stream, soapy water up to her elbows. What I had expected from the most famous and well-respected oracle was some level of “slick” or “polished”. What I had NOT expected was the tiny granny at my feet, washing clothes. Choldan (Stanzin’s husband) told her that we had come for a reading. 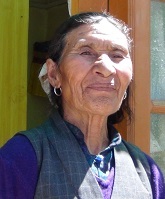 She glanced over her shoulder at us, and said (in Ladakhi) that she wouldn’t read for just one person, and that we could wait in her garden to see if others came. There was another flurry of words. Choldan said, “American”. The Oracle turned back around to look me up and down, and said, “Huh.” She then banished us to the garden, saying, “Eat some apples”. I asked Choldan, “Is this hospitality, or is this part of the ritual?” He shrugged and grabbed another tiny apple. Then, we were called forth. The Oracle was already seated at a tiny table, with a candle, rice, barley and other containers and objects. She was chanting and slowly donning her ritual costume, one that would eventually cover everything except her eyes. Suddenly, she called the first person forward. There was a little debate as to who should go first… once I realized that the person did not want to be recorded (and turned off my camera), he was okay with going first. Will the new information/direction/book that I received when I was in the cave be helpful in transforming society/ changing the world? Should I stay in America, or move to some other location? I stayed until the end, when she took off her costume and tried to pull herself back into our shared reality. It took 5-10 minutes of air gulping, hiccupping, shakes, and worse before she was able to open her eyes and look around at us. The apples on our tree are about ripe. I’ll eat some in solidarity with you! As for the Oracle’s advice for you to have an assistant—I’m available!— you know what I’m about—also I’m a great cook ( you already know that). Don’t worry about you high tech devises—stay in the moment my friend. there is one more called padma lamoo in sabu.if you have time p.l meet her too.she lives bellow the nunnary.stanzine knows the place. please visit nunnary and convey my best wishes 4 their spiritual journey. It’s interesting to me that the current Science of Mind magazine has an article by Roger Teele (major, “high-pulpit” Religious Science minister) on how he has taken five (!) groups to see John of God–another seer whose methods are FAR outside Western healing-and-knowing modalities. Thank you for sharing your experience, too, Sharif. I look forward to your future stories and realizations! I express infinite gratitude to you for taking all of us on this sacred journey with you. I have complete Faith in your success regarding the complete fulfillment of your life’s purpose. Very Good!! I’m glad your coming back to Portland!! I will get to see you when you get back and keep associating with brilliance! Thank you for taking this journey! I hope you found the JOY, you were looking for. Blessings, from Singing Alive camp. This is confirming for me (and others, I imagine) that the desire for a world that works is a desire that may be successfully manifested, and that the inclination to support you in this quest was true and accurate. That supporting one another in the formation of a vision helps in that formation and compels the quester of the vision to transcend old behaviors and limitations if they were doing it alone. I like to think my support added to that of many others back here in Portland contributes in some way to the courage and strength you are mustering for the success of the adventure. And that the oracle sensed the depth of that support in its attention to you. Thank you with Gratitude – Sharon may you be well on your journey…. What an amasing journey! And, how great that you’re making the most of it. Go well. Thank you so much for this, Shariff! I am honored to be your friend and to be able to share your experiences. I am touched! And remember that Tom and I are waiting for you to stay with us when you get back. Be assured you have a home here :). Looking forward to reading more and more! YOU will succeed. Good news for us all! And, for some reason I am now hungry for an apple. Thank you, Sharif, for this vivid description of your time with the Oracle of Saboo. I look forward to reading your piece on what happened in the cave.